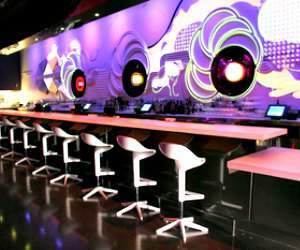 These fun Las Vegas bars and lounges located on The Strip, or very close to it, play live or DJ spun music. They are perfect places to finish an eventful evening, or to start your night escapade, for that matter! 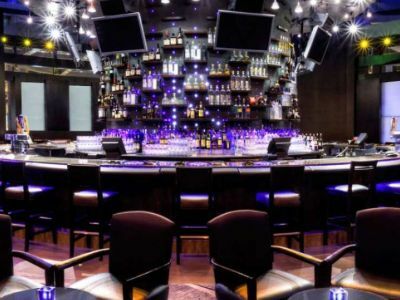 You can find almost any kind of bars or clubs in Vegas: sports, karaoke, gay bars, Ice bars, not to mention nightclubs, and pools and even Oxygen bars in case you need a breath of fresh oxygen after a real bar! Review: Centrifuge, one of the popular Las Vegas bars, is a modern breathtaking place which will make your night unforgettable. Advanced technology with best dance music will give you a feel of a lifetime. Hip hop, techno, dance remixes, are al there for you to have a great dance away night. 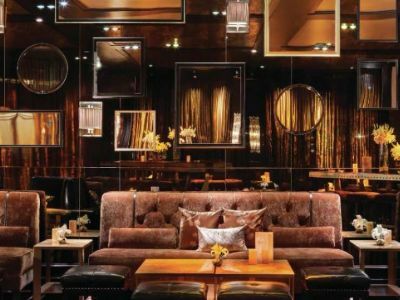 This Las Vegas lounge is perfect if you have too much energy and want to spend it in a high quality place. The lounge is also ideal for a relaxed evening in a comfort seat with a good drink. Check out their drinks menu, they make special mixes here. The place is reasonably isolated to provide privacy. Review: Bond is a must go if you appreciate a nice view and have love for light shows. 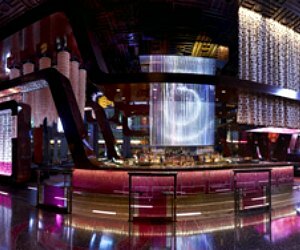 One of tastefully designed Las Vegas bars with live music, Bond has enough LED displays and LCD screens to make you feel in a special place. Come here for a mix of drinks you won't be able to experience anywhere else. Guarantee of a good time is the live music performances. Dance to it if you choose to, have your glass of specially mixed martini to it if you want to. Don't miss the evening light show. Bond is where the taste is. Hours of operation: Friday-Saturday 5 pm.- 2 am; Sunday-Thursday 5 pm-12 pm. Review: Brand Lounge is among the smallest and cosiest Las Vegas bars, where you can get good food and strong drinks. Bring your party to this lounge and emerge into an atmosphere of glory and energy. Open bar for ladies is available for about $20. Watch out for promoters outside the lounge. Their deals might be deceiving. The place has a good dance floor as well as plenty of seats if you prefer a bottle service. Rarely overcrowded, the Brand Lounge offers good service and enough personal space. Top 40s and hip hop are mostly played, although music varies depending on a night. 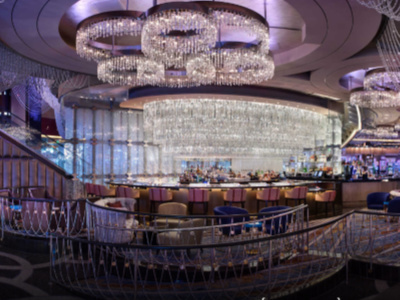 Review: The Chandelier is an absolutely stunning lounge you must see when you are in Vegas. It's a chandelier you will find yourself partying in. Three floors of the most gorgeously and very unusually decorated Las Vegas bars are full of beautiful people, great drinks, and lots of fun. The prices are high and are well worth paying for. 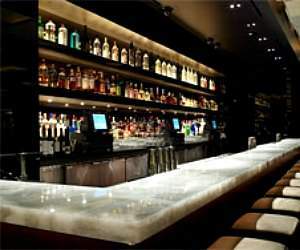 This Las Vegas lounge has plenty of space for sitting down, great vibe and well selected music. Certainly a VIP place with good service. Check out their cocktail menu. You will definitely find something to your taste. Celebrities too come to the Chandelier to party. Review: EyeCandy is easy to get into, and it's simply one of the best Las Vegas bars and lounges. You will probably have no line to wait in, and have no cover charge. Both the dance floor and the lounge space are big enough to have a great evening. The music played depends on the DJ and the choices are usually great. This lounge has reasonably high drink prices. The crowd is fun. The place is small but does have two big screens with videos which add to the experience. Come relax here in the lounge area or dance your night away if that's what you do for relaxation. Review: Margaritaville is where you go for your Margarita. 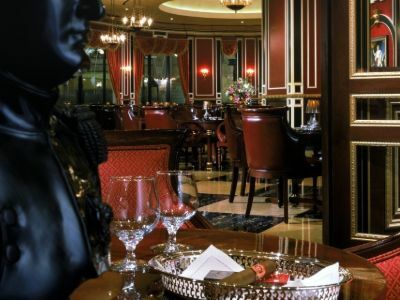 Good food and lounge music make it a perfect place for a bite and relaxation. 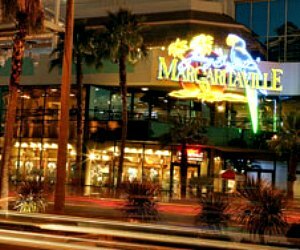 One of the best Las Vegas bars with live music, Margaritaville has a nice atmosphere and good service. Make sure you try their hamburgers and nachos when you drop by for a chill. Nice place for watching the strip. Happy hour is when you want to be here. Some celebrate their wedding here. Check out their Clipper Room if you are a bride looking for a good deal. Margaritaville is definitely a place to be on your list for anytime you feel hungry and need a good vibe. Hours of operation: S Mon - Sun: 4pm - 4am. Review: If you are looking for Las Vegas bars with the best view, Level 107 Lounge is your best bet. Level 107 looks its best after dusk. 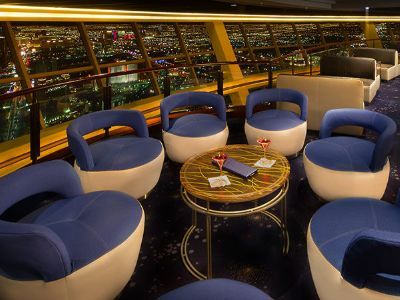 This place will take you up to a rotating floor in a special elevator to enjoy night Las Vegas view. Watch the lights turned on as the city emerges into its night life. The observation deck in this lounge is a must see. It's also one one Las Vegas bars appreciated for their happy hours You get half off of the appetizers and two drinks for a price of one during this time of the day. The place is spacious and it's never overcrowded. Live DJs perform nightly from 11pm - 4am. Good service, great music, fabulous atmosphere at Level 107.
Review: Las Vegas bars where you can listen to piano? Easy! Napoleon's Piano Bar is where good music is. If you've got an ear for good songs and got taste in music, this Las Vegas lounge is the place to be. The crowd here is a bit older and they know what they are looking for. Don't expect to be nicely fed here, a drink or two and off you go for a fun night. Have them sing you happy birthday if it's your birthday. It's one special experience. Bring your party here and a good night is guaranteed. The piano players are very talented and funny. Prepare a list of songs you want them play for you. 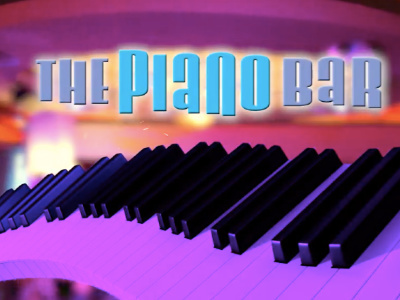 Review: The Piano Bar at Harrah's is one of the two famous Las Vegas piano bars on the Strip where you can hear talented pinaists play, the other being the Napoleon's Pinao Bar at Paris Hotel. Mostly classic songs are selected but you can order whatever song you like. They do use computerized drum noises for background sound and the piano performance becomes one special experience. Cheap drinks make this a place full of fun audience willing to go on stage any time and sing. The atmosphere here is great. You are guaranteed to have a fun night. There is no cover charge. Come enjoy the relaxing piano performers for hours after a long tiring day in Vegas. 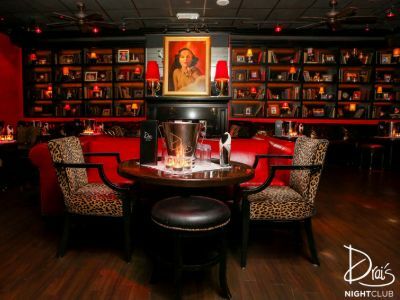 Review: Lily Bar and Lounge is a among the most nicely designed Las Vegas bars. Be prepared to pay for the VIP service and drinks menu. Located in The Bellagio casino this lounge has good music and a great fun crowd. This is not a place for a quiet conversation, therefore be prepared to party. Hurry to get your drinks before 2:00 am and enjoy the good food, the luxurious atmosphere and a loud dance away night. There are a lot of seats available if you are a people watcher. Friendly staff will certainly accommodate you according to your needs. Review: The Peppermill Fireside Lounge is one of the most popular Las Vegas bars, especially among couples in love. Large portions, homemade chips and other goodies on the menu will definitely bring you to a good mood. This Last Vegas lounge plays music videos on TVs but the list is kind of outdated. The place is overcrowded with food lovers so be prepared to wait in line. Hot waitresses are quick and efficient, the selection of drinks is good. Reasonable prices will make you happy. Food is also served in the lounge area. Dark lighting adds to the evening Vegas atmosphere. This place is ready to serve you 24/7. Review: Revolution Lounge is among the most popular Las Vegas bars - it's nicely designed with a great nightlife feel to it. Modern colors and techno design set you in a party mood. Get your VIP bracelets for free drinks and get on with your great evening. Life here is at its best at around midnight. A mix of house and club music is what you can mostly get here. Earlier years' music is also advertised and what is played depends on the night and the DJ. The Revolution Lounge is one of the smallest and nicest Las Vegas bars with great service despite being crowded on the weekends. 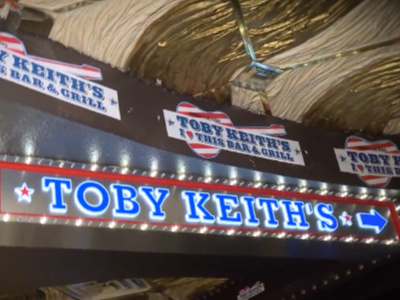 Review: Toby Keith's is located in Harrah's Hotel & Casino and is one of the coolest Las Vegas bars on The Strip for country music lovers. If you got hungry come to this Toby Keith's and make your stomach happy as if you are being fed at your country side relatives' place. Country music videos are played on large TVs, there is some dancing area available and of course a bar with good drinks is always ready to fill you up. Service depends on what waiter you got and ranges from very good to not very good. If you are a loud party lover, night time is your time at Toby Keith's. 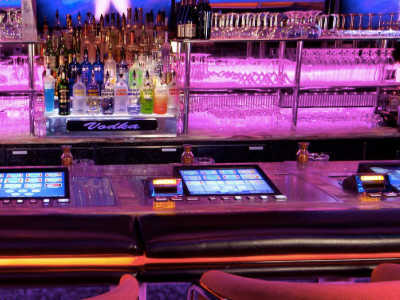 Review: V Bar is located on the Strip, inside the casino of the Venetian Resort Hotel Casino. This is a modern lounge decorated in an up-to-date style and is great for a relaxing after party hours. Check them out during happy hours from 5 to 8 pm and pay no cover charge before 9 pm. This Las Vegas bar/lounge does get very busy later in the evening so come early to get your table if you are looking for a bottle service. 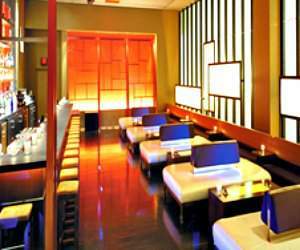 Friendly waitresses and highly efficient bartenders make the service exceptional. There is room for dancing and DJ plays good dance music. V Bar is one of the best Las Vegas bars to smoke great hookah. Drai's Afterhours is a fun place to bring your party to. Great energy, loud music, everybody dancing here. 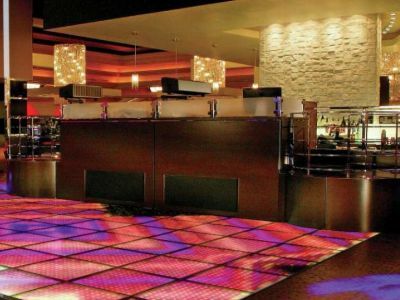 Be prepared to wait in a line to get in this Las Vegas nightclub/ bar, and it's well worth it. There is an elevator that will take you down to an underground floor which sets you in a special party mood. Good sound system and great choice of music will make your evening fun. There is a cover charge for the club. There is also a separate hip hop room. You'll need to order bottle service to get in. Definitely a dance party place. 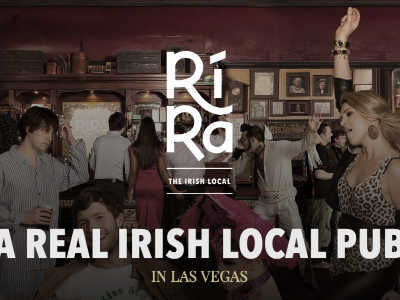 Review: Ri Ra is the most famous of all Irish Las Vegas bars and pubs, with Irish music and Irish food. Ri Ra will make you want to dance and sing along to the Irish bits. Skilful performers will make your night unforgettable. This place is a must visit when you are in Vegas if you want to experience Ireland. Staff is native Irish. Their lovely accent and great service will make you feel in Ireland. Their corned beef is what visitors keep coming back for. Other food on the menu is worth trying as well. Ri Ra is on the list of reasonably priced Las Vegas bars for drinks - be sure to check out their drink of the month mix.